In the movie Before Midnight, the team of director Richard Linklater and actors Julie Delpy and Ethan Hawke set themselves the monumental task of portraying a single day in the life of a privileged Franco-American couple, while summarizing the last nine years of their relationship, and fall just short of creating a masterpiece. 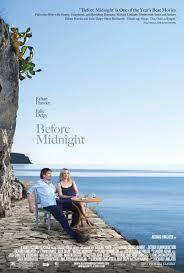 Before Midnight is the third installment of a series that began with Before Sunrise (1995) and continued with Before Sunset (2004). Each film portrays less than twenty-four hours in the lives of two characters, the French environmental activist Celine (Deply) and the American writer Jesse (Hawke), entirely through conversations. All of the films are deeply committed to a realism that emphasizes the flow and rhythm of actual talk. So the movies allow Celine and Jesse’ words to jump wildly from point to point, and expose their characters’ thoughts and emotions in ways that are raw, immediate, sometimes uncensored, and sometimes painfully unflattering. Which means the experience of the Before movies is much closer to the experience of living our lives than watching a typical movie, in which a controlling intelligence works hard to clean up the dialogue, make the characters look good (or chooses exactly how and how much they will look bad), and impose a structure on events that gives them an implicit sense of purpose and meaning. These choices are particularly effective in Before Midnight because you no longer have the pleasure of watching Delpy and Hawke meeting or re-meeting cute, with an unknown happy future in front of them, but rather seeing them living the reality of that future in which their romance, their jobs, and the work of raising their children have become highly specific and in many ways, unsolvable problems. Before Midnight is also powerful because the movies gets so deeply into the characters of Celine and Jesse that whether we as the audience like them or don’t like them, or whether Linklater-Delpy-Hawke care if we like them or not, is irrelevant. The questions are whether Celine and Jesse can like themselves, or each other, or find a way to preserve the mystery of the love between them – now that the persuasion of its first blossoming is long past – or find happiness from lives in which it seems clear no transcendence will emerge. Both Hawke and Delpy should get medals for acting courage in Before Midnight, but Deply in particular deserves praise. Her Celine is in a state of greater crisis than Jesse, and she holds nothing back. She looks and feels her age in a way women in movies rarely look or feel. My only quibble is a technical one. Because Before Midnight has nine years to cover in the life of Celine and Jesse, it sometimes feels over-packed and over-busy. For example, during a long argument in a hotel room, Celine brings up a whole basketful of problems she’s had with their relationship, and the realism of the conversation slips into the feeling that Linklater-Delpy-Hawke are trying to shove a summary of their last nine years into a single take. An even bigger problem here is that they are asking us to believe that Celine kept many of these problems to herself all this time, and Celine is a character who the films have conclusively demonstrated keeps NOTHING to herself. But these are small flaws compared to what the movie achieves. Few films hold a mirror up to its audience as relentlessly and unflinchingly and persuasively as Before Midnight. Go see it.